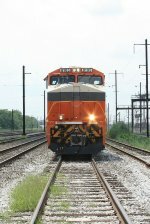 Title: NS ES44AC 8105 "Interstate"
Description: NS ES44AC 8105, the Interstate Heritage unit on the point of a 650 in Enola Yard. 3 down, 17 to go! Description: Flank view of NS Interstate heritage locomotive 8105 at Bay View yard. Description: Oblique view of NS Interstate heritage locomotive at Bay View yard. Description: NS Interstate heritage locomotive 8105 with empty hopper train 633 is ready to go in the departure yard at Bay View yard, Baltimore, MD. Description: Nose view of NS Interstate heritage locomotive 8105 at Bay View yard, Baltimore, MD. Description: Rear oblique view of NS Interstate heritage locomotive at Bay View yard, Baltimore, MD. Description: NS 8105, the Interstate Railroad heritage unit, leads empty coal train 633 north through the interlocking at CP WYE. After driving all the way to Sunbury, I never caught up to this train. Description: A closer view of the NS 8105, the Interstate Railroad Heritage unit, on empty coal train 633. Description: NS 8105 ES44AC is sitting northbound with coal empties in the siding at Keating, PA on the north end of NS trackage on the former Pennsy Buffalo line. Title: NS HERITAGE AT CASSANDRA PA. 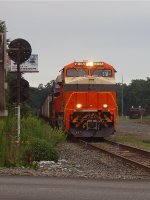 Description: NS 8105 (Interstate) moves train 576 west on the Fort Wayne Line at Sebring, Ohio. Description: Interstate heritage leading train 861 into West Virginia as it heads for Williamson. Description: The "popsicle" locomotive trails an SD60 into Bluefield yard. Description: NS train 767 rolls West through Elliston Virginia with the Interstate Heritage unit in the consist. Description: NS empty coal train 767 rolls through Elliston Virginia on the Christiansburg District. 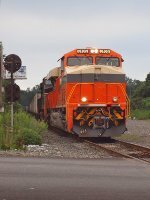 Description: Empty coal train 767 rolls through the "S" curve in Shawsville Virginia. Description: NS ES44AC 8105, the Interstate Railroad heritage unit and an SD60 leads an loaded coal train through Falls Mills, VA. Description: Interstate Heritage unit leads NS coal train 762 down the Pokey. Description: Interstate unit leads train 762 down the Pokey. Description: NS Interstate Heritage unit leads coal train 762 down the Pokey through Bluefield Virginia. Description: Interstate Heritage unit leads train 762 down the Pokey. Description: Loaded coal train 762 rolls down the Pokey behind the Interstate Heritage unit.